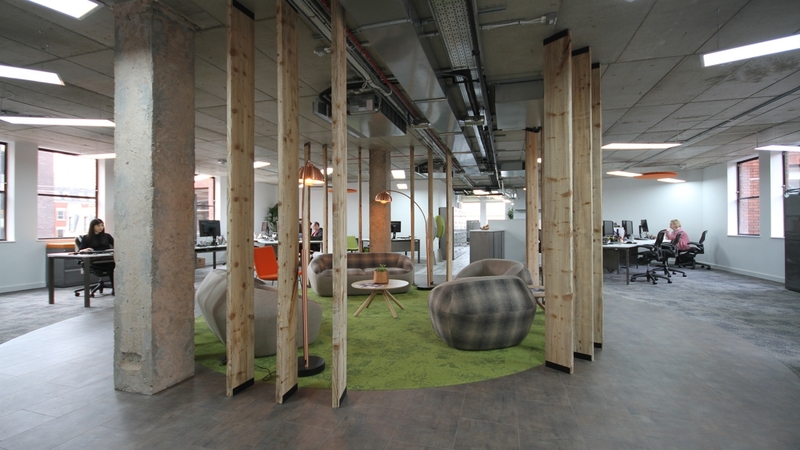 Biophilic Design - Is there a place for nature in the workplace? We all know how calming and restorative it can be to enjoy a walk in idyllic countryside on a lovely day – but did you know that the long-term absence of greenery and nature in our lives is now believed to have an adverse effect on our mental wellbeing? Scientists and researchers have recorded benefits in buildings that connect people with nature, such as hospitals where patients have healed faster; schools where children’s test scores have risen, and offices where employees are more productive, as well as communities where neighbours and families are doing better. The Human Spaces website has released a report saying that introducing the natural world into the work space (technical term = biophilic design) has been a crucial determinant of both and employee’s success and happiness in his or her role in the workplace (HumanSpaces report download). According to this report, office workers who had access to natural elements such as greenery and sunlight reported a 13% higher level of wellbeing and an 8% productivity rate than colleagues without. Ben Johnson Interiors are increasingly being asked to introduce these biophilic design elements into client workplaces. 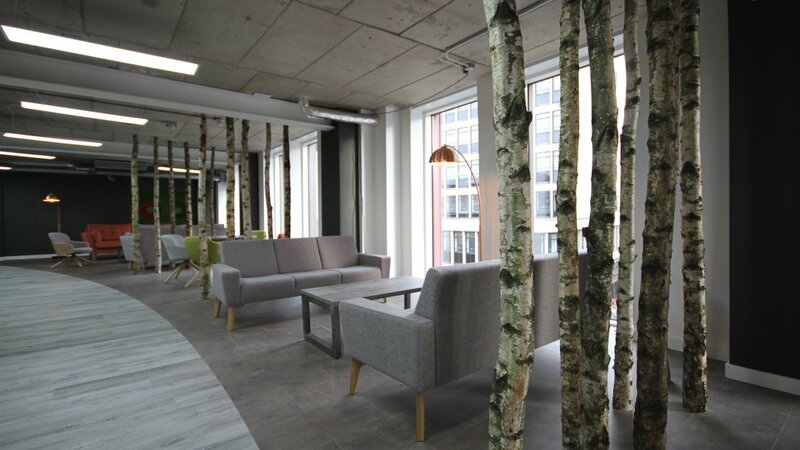 Being specialists in cutting-edge workplace design, we have introduced a number of idiosyncratic solutions for clients, for instance: attractive birch wood dividers into a large Leeds office; a number of green spaces in the form of living walls; and preserved moss walls, shaped into client logos and imagery such as largescale maps. Some green walls also work as great sound absorbers and are frequently used in offices where low acoustic levels are a priority. • Nature present in the space, in the form of natural light, plants or living walls. • Patterns or forms that evoke natural elements. • Structures which represent natural spaces. A combination of all three has been proven to directly improve the way people feel about and contribute to work, generating better staff wellbeing and better financial returns. 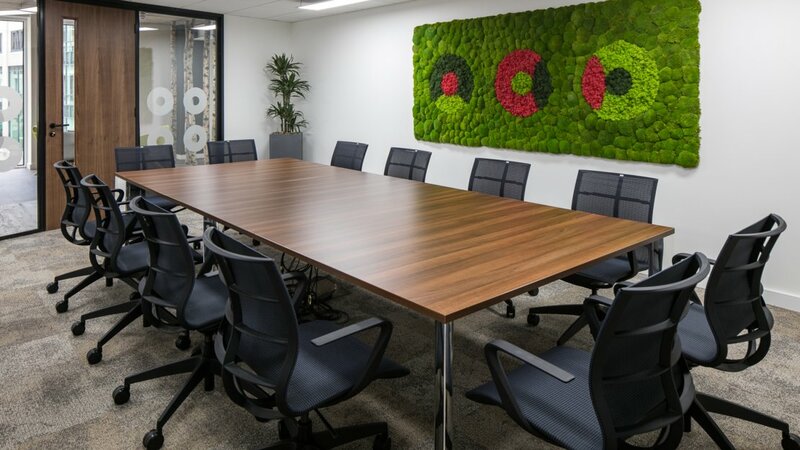 Ben Johnson Interiors will always consult with you to incorporate biophilic elements into your workplace designs if appropriate – no matter how large or small the project – to help your staff to be happy and motivated at work. The newest trend in biophilic interiors. The moss walls are a lightweight, hassle- free and cost-effective solution, allowing you to experience the touch, scent and eye-catching impact of the real thing! 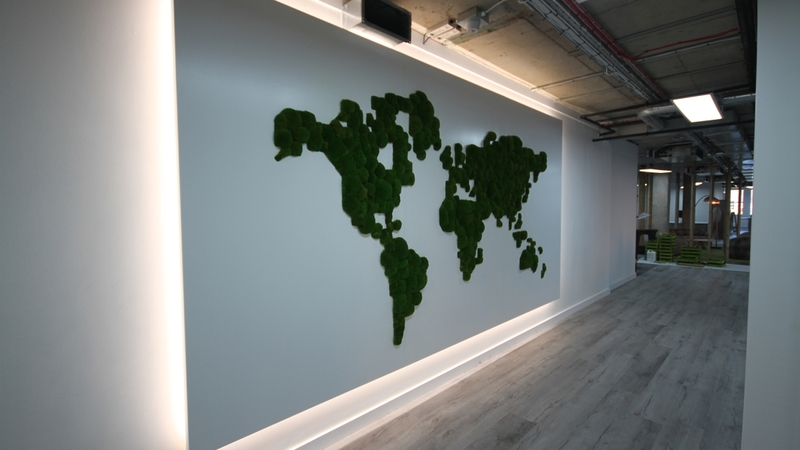 Moss walls are custom made, so any shape and size is possible. See the images at the top of the article for examples. A well-designed, flourishing wall can drastically improve an interior appearance. Eco walls are specifically designed, using different varieties of plants which can vary in colour, growth, texture and flower to create living art. You’re giving people a broader range of visual stimulants – otherwise only experienced outside – which is shown to improve mental health. The imaginative use of plants and floristry adds colour and fragrance which can make a huge impact to a workspace, at a relatively small cost! Many of our clients choose to lease plants and floristry from a specialist such as Vantage who can offer comprehensive after-sales support including cleaning, watering, trimming and pest control. Timeless and warm, with an intricate natural surface, wood adds both comfort and richness to any interior. For centuries, wood has been used because of its ease of workability, its durability, and its jaw-dropping beauty. The use of wood is an especially popular choice for modern accent walls and dividers. Wood walls are contemporary and add warmth to the sometimes sterile feel of a commercial office. Research shows that a visual connection with nature patterns improves wellbeing and helps to reduce stress, and alleviates attentional fatigue, sadness, anger, and aggression. Spaces that include natural geometrics such as fractals and curves, can be highly evocative and satisfying, providing improved mental engagement, attitude and overall happiness!